AUD 7,418 Excl. Duties / Taxes. This Heart diamond is 1.09 carat in weight, and comes with Very Good polish and Good symmetry, as verified from an independent gemological laboratory. The diamond is graded D in colour, and has a clarity grade of SI1. The diamond's GIA grading report number is 6157142151, which will detail further its specifications and measurements, and will also come with the purchase of the stone. This Heart diamond is 0.79 carat in weight, and comes with Good polish and Good symmetry, as verified from an independent gemological laboratory. The diamond is graded E in colour, and has a clarity grade of VS1. The diamond's GIA grading report number is 6157832786, which will detail further its specifications and measurements, and will also come with the purchase of the stone. AUD 9,579 Excl. Duties / Taxes. 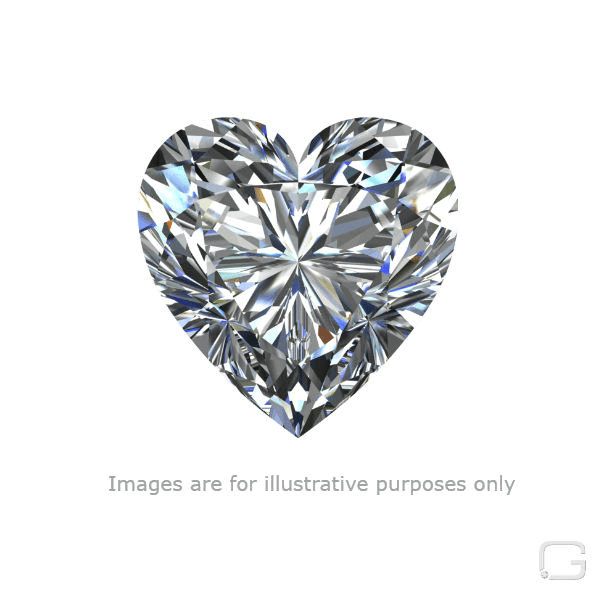 This Heart diamond is 1.51 carat in weight, and comes with Good polish and Good symmetry, as verified from an independent gemological laboratory. The diamond is graded E in colour, and has a clarity grade of SI2. The diamond's GIA grading report number is 16348107, which will detail further its specifications and measurements, and will also come with the purchase of the stone. This Heart diamond is 0.7 carat in weight, and comes with Good polish and Good symmetry, as verified from an independent gemological laboratory. The diamond is graded I in colour, and has a clarity grade of SI1. The diamond's IGI grading report number is 134453397, which will detail further its specifications and measurements, and will also come with the purchase of the stone. This Heart diamond is 0.8 carat in weight, and comes with Good polish and Good symmetry, as verified from an independent gemological laboratory. The diamond is graded I in colour, and has a clarity grade of SI1. The diamond's IGI grading report number is 134453396, which will detail further its specifications and measurements, and will also come with the purchase of the stone. AUD 18,153 Excl. Duties / Taxes. This Heart diamond is 1.87 carat in weight, and comes with Good polish and Good symmetry, as verified from an independent gemological laboratory. The diamond is graded H in colour, and has a clarity grade of VS2. The diamond's GIA grading report number is 6167321233, which will detail further its specifications and measurements, and will also come with the purchase of the stone. AUD 4,561 Excl. Duties / Taxes. This Heart diamond is 0.83 carat in weight, and comes with Good polish and Good symmetry, as verified from an independent gemological laboratory. The diamond is graded F in colour, and has a clarity grade of SI1. The diamond's GIA grading report number is 7193125550, which will detail further its specifications and measurements, and will also come with the purchase of the stone. AUD 12,616 Excl. Duties / Taxes. This Heart diamond is 1.82 carat in weight, and comes with Very Good polish and Good symmetry, as verified from an independent gemological laboratory. The diamond is graded I in colour, and has a clarity grade of SI1. The diamond's GIA grading report number is 2151628069, which will detail further its specifications and measurements, and will also come with the purchase of the stone. AUD 5,324 Excl. Duties / Taxes. This Heart diamond is 1.01 carat in weight, and comes with Very Good polish and Very Good symmetry, as verified from an independent gemological laboratory. The diamond is graded H in colour, and has a clarity grade of VS2. The diamond's IGI grading report number is S3G28460, which will detail further its specifications and measurements, and will also come with the purchase of the stone. AUD 13,388 Excl. Duties / Taxes. This Heart diamond is 2.18 carat in weight, and comes with Good polish and Good symmetry, as verified from an independent gemological laboratory. The diamond is graded G in colour, and has a clarity grade of SI2. The diamond's GIA grading report number is 6192756379, which will detail further its specifications and measurements, and will also come with the purchase of the stone. AUD 21,326 Excl. Duties / Taxes. This Heart diamond is 2.4 carat in weight, and comes with Good polish and Good symmetry, as verified from an independent gemological laboratory. The diamond is graded I in colour, and has a clarity grade of SI2. The diamond's GIA grading report number is 2135054276, which will detail further its specifications and measurements, and will also come with the purchase of the stone. AUD 14,783 Excl. Duties / Taxes. This Heart diamond is 1.78 carat in weight, and comes with Very Good polish and Good symmetry, as verified from an independent gemological laboratory. The diamond is graded E in colour, and has a clarity grade of SI1. The diamond's GIA grading report number is 1136642086, which will detail further its specifications and measurements, and will also come with the purchase of the stone. AUD 29,452 Excl. Duties / Taxes. This Heart diamond is 2.1 carat in weight, and comes with Good polish and Good symmetry, as verified from an independent gemological laboratory. The diamond is graded E in colour, and has a clarity grade of SI2. The diamond's GIA grading report number is 2191966004, which will detail further its specifications and measurements, and will also come with the purchase of the stone. AUD 5,762 Excl. Duties / Taxes. This Heart diamond is 1.35 carat in weight, and comes with Good polish and Good symmetry, as verified from an independent gemological laboratory. The diamond is graded K in colour, and has a clarity grade of SI1. The diamond's GIA grading report number is 2141933465, which will detail further its specifications and measurements, and will also come with the purchase of the stone. AUD 60,977 Excl. Duties / Taxes. This Heart diamond is 3.17 carat in weight, and comes with Good polish and Good symmetry, as verified from an independent gemological laboratory. The diamond is graded D in colour, and has a clarity grade of VS2. The diamond's GIA grading report number is 2165061285, which will detail further its specifications and measurements, and will also come with the purchase of the stone. AUD 7,567 Excl. Duties / Taxes. This Heart diamond is 1.21 carat in weight, and comes with Good polish and Good symmetry, as verified from an independent gemological laboratory. The diamond is graded G in colour, and has a clarity grade of SI1. The diamond's GIA grading report number is 10086773, which will detail further its specifications and measurements, and will also come with the purchase of the stone. This Heart diamond is 0.54 carat in weight, and comes with Very Good polish and Good symmetry, as verified from an independent gemological laboratory. The diamond is graded K in colour, and has a clarity grade of SI2. The diamond's GIA grading report number is 2185836184, which will detail further its specifications and measurements, and will also come with the purchase of the stone. AUD 1,908 Excl. Duties / Taxes. This Heart diamond is 0.62 carat in weight, and comes with Very Good polish and Fair symmetry, as verified from an independent gemological laboratory. The diamond is graded D in colour, and has a clarity grade of SI1. The diamond's GIA grading report number is 5202052400, which will detail further its specifications and measurements, and will also come with the purchase of the stone. This Heart diamond is 0.82 carat in weight, and comes with Good polish and Good symmetry, as verified from an independent gemological laboratory. The diamond is graded E in colour, and has a clarity grade of SI1. The diamond's GIA grading report number is 5141139469, which will detail further its specifications and measurements, and will also come with the purchase of the stone. AUD 4,071 Excl. Duties / Taxes. This Heart diamond is 0.96 carat in weight, and comes with Good polish and Good symmetry, as verified from an independent gemological laboratory. The diamond is graded I in colour, and has a clarity grade of SI2. The diamond's GIA grading report number is 5182861896, which will detail further its specifications and measurements, and will also come with the purchase of the stone.